As we reflect on our discussion ‘Whose Social Model?’ with Triple C at HOME in Manchester. We’re joined by dancer Joel Brown, for another perspective on the social model and how it’s easier said than done. Disclaimer: the views, thoughts, and opinions expressed in this text belong solely to the author. They are not necessarily shared by Unlimited. 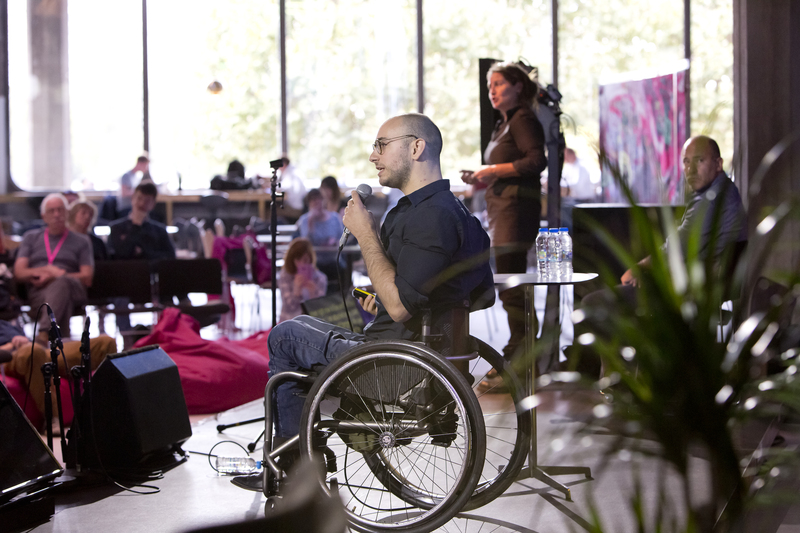 Should disabled artists use the social model of disability? As a dancer I consider myself a post-modern, release-based mover with a hint of a wheelchair-skateboarder. I’m drawn to high physicality and muscularity which I’m aware puts me in a heteronormative-hyper-masculine-paraplegic-supercrip-popping wheelies-tricks-image. I enjoy this physicality and I’m working on it. What you won’t see is an image of me like those Paralympic adverts across London with an athlete standing over the word, “disability” with the “dis” crossed out. Another bit of humbling imagery is I’m balding, which is…fine. Also, I’m the annoying guy at the house-party with a guitar who only sings his own sad songs and expects you to listen, but for this article, let’s stick with dance. I started waking up to a disabled identity and experience beyond my own in 2011 when I joined AXIS Dance Company and moved to the San Francisco Bay Area from Salt Lake City, Utah. Moving to the birthplace of the American Disability Rights Movement as well as an area whose history is famous for fighting for human rights and joining an organization founded in 1987 by a group of women with/without disabilities and working under the directorship of Judith Smith, a fierce disability/LGBTQ/animal rights activist put me on a fast-track of learning coming from my white, Utah-Mormon-boy upbringing. Though AXIS is first and foremost a professional artistic entity, I quickly acclimatized to an environment that bound its art, experience and politics into a whole. I found myself in a rich culture of diversity and access that I am wholly grateful for. With its 20% wheelchair accessible tube network, “booking assistance” for 100% of national rail services, segregated accessible toilets behind locked doors, TFL staff trained to check “where you’re going”, (the weight of empathy) and a bus system that police’s against me having any friends in wheelchairs and insists my body face a specific direction; well it gets me down. On top of this the fact that I am a migrant worker prevents me from government schemes such as PIP or Motability which would relieve me of some of the stress and extra costs. This paragraph might be boring to you who already know so I’ll just add that I think access should be a universal human right, not a privilege of citizenship. As a dancer I am keenly interested in movement. This means that when I’m working, I am intimately attuned to my own body, which means impairment, T-4 paraplegia, keeping my balance; tuning into my body as dancers do means tuning in also to tyre pressure, bearings sensitivity, castor-positioning, maybe I can afford to bring my axle forward a bit, I’ll be a bit tippier, but I’ll turn faster, should adjust my footrest, my left trapezoid is a bit tight, need to stretch more, when was the last time I peed? How fast can I clean and degrease my castors without interrupting rehearsal? How long have I been in this position, need to shift, time, space, rhythm, see everyone else, know where your body is that you can’t feel directly, navigate ableist ignorance and well-intended language that you don’t have time to address because we’re busy with choreography and you’re the only one in a wheelchair anyway, you’re outnumbered and they’ll justify what they meant because nothing is more threatening to white people than good-intentions being questioned, I think I farted, do I need to poo again? Can I afford to wait? Don’t be bothered that your journey took 15-30% longer than if access allowed you a direct route and the constant offers of assistance get in the way of your presence. Be present, you’re a professional, this is about dance, after all, not disability. Working with detail means becoming intimately in tune with my body; its physical realities, which is what I love about dance. Sitting in my wheelchair, if I lean forward, chest to knees, I can’t sit up unless I use my hands to push myself up. However, if you gain some momentum going backwards and grab your wheels, that kinetic energy will transfer into your shoulders, raising your torso and giving you a movement connection to go elsewhere. What a feeling! I’m interested in a joy in movement, in paraplegic movement, in wheelchair dance, in floor work. Do I use a social model of disability when I dance? Probably not, but that’s not its use. I see the social model as a macro-lens of disabled experience that places the onus of discrimination on inaccessibility. I recently read Michael Oliver’s “Understanding Disability: From Theory to Practice (second edition)”. Oliver, the British academic who coined the term, “the Social Model of Disability”, though not the theory itself, died a few weeks ago. I wish I could say I knew his name before his death. “We Shall Overcome” may have too strong a connotation, history and trope of well-intended trauma for us, but I think we could be a bit more (trigger-warning: inspiration) inspiring. My only criticism with the social model is that it’s argued too seriously and its language is too easily adopted by government/organizations who preach something greater than what it offers. It’s easier said than done, and it’s still difficult to say. Enough theory. Can we have step-free trains now? Reading Oliver felt like finding a friend you’ve been searching for, sharing a charmingly cynical conversation with enough disagreement to keep it interesting and enough in common to feel like you’ve reconnected with a long-lost brother. See you in heaven where we’ll finally be free from the chairs. Art and the Social Model: Why make it harder?